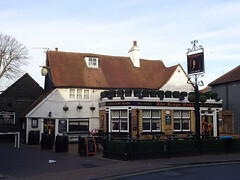 A partially sixteenth century timber framed pub in Bexley, still with a very country inn feel. secretlondon has been past it in July 2015 and can confirm its existence. There is a beer garden and often people drinking outside after work. I do not know if the jazz club is still running and when it cost £5 to get in. Last edited 2017-12-17 17:44:59 (version 10; diff). List all versions. Page last edited 2017-12-17 17:44:59 (version 10).